Newport, Rhode Island is a great old town to explore…and we’re lucky that we live just a half-hour away. But Newport gets ridiculously crowded in the summertime, so we visit before the season starts or wait until the season is over before we even dare to set foot anywhere near its historic waterfront. But when we heard that one of our favorite restaurants, Fluke, hired a new chef, we broke our own rules and made a special trip to check things out. The first change is the name: formerly Fluke Wine Bar & Kitchen…now Fluke Newport. Straight to the point, emphasizing its location: one of the oldest cities in the country, founded in 1639. Their philosophy is simple: the freshest locally caught fish and seafood when possible. Jeff and Geremie Callaghan, owners of Fluke, have been in the biz for a long time, and we’ve been fortunate to know them for over a decade. We met one cold winter night, when my radio station Christmas party, being held at one of the mansions on Bellevue Avenue in Newport, went horribly wrong when they insisted on playing that lame “murder mystery theater” thing in the middle of dinner. My wife and I, being new parents at the time, and cherishing our very rare date night alone, ditched the Christmas party the moment we saw what was going on and made our way quite randomly to the bar on the third floor of Fluke, where Jeff introduced us to many wonderful sipping rums. I consider Jeff my mentor in this area, showing me there was far more to rum than a Captain and Coke. The bar at Fluke Newport. The bar has changed a little bit at Fluke Newport…where rums used to dominate, now there are bourbons…a sign of the times. But the creative bartenders use top quality spirits and hand-pressed juices in their cocktails. Chef Eddie Montalvo, hands-on in the kitchen. The new chef at Fluke is Eddie Montalvo, a graduate of Johnson & Wales University in Providence. He worked at the highly respected Al Forno in Providence before moving to New York City, where he worked for many years for restaurant legends like David Bouley, Daniel Boulud, Danny Meyer and others. Once Eddie became a family man, and he realized he didn’t want to raise a child in the city, it was obvious that a change of venue was needed, and he left New York for Newport. 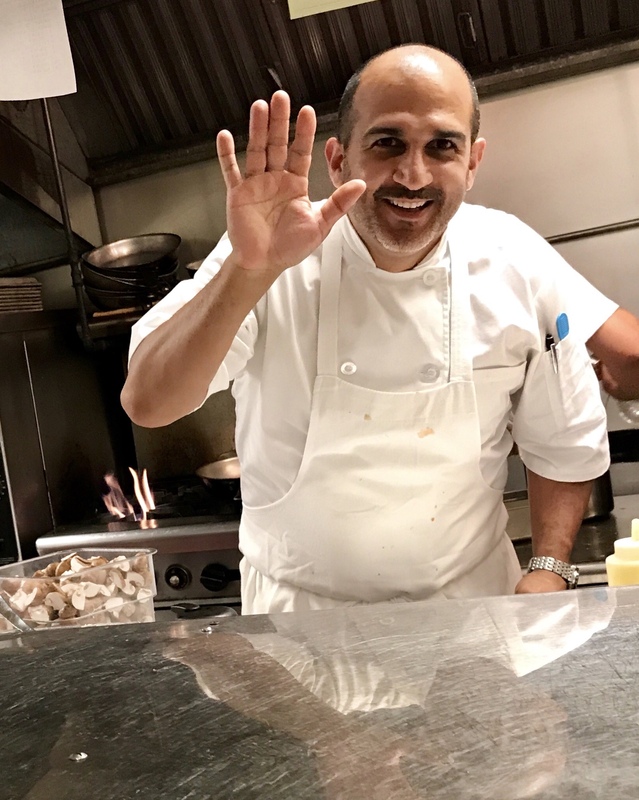 It’s clear that the move was not only great for him, but for Fluke as well (it was due for an injection of fresh ideas) and even the Fluke owners and staff, who seem re-energized by a talented new chef at the helm. Eddie came to our table and we talked at length about food and life, and how the two play a crucial role in our existence. We instantly realized this was not only a talented chef, but a nice guy, not something you always find in one person! He started us off with an appetizer of foie gras Paris-brest. Paris-rest is a popular sweet pastry. 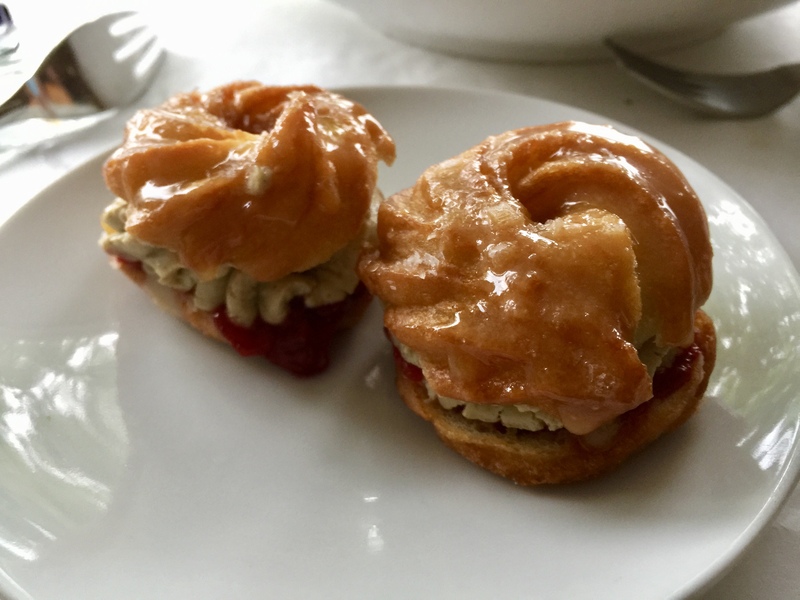 They add local strawberry jam and foie gras to make little sandwiches that are sweet and so rich and satisfying. So good as an appetizer, I was already planning to have it again as dessert! Next came an experimental plate. Chef Montalvo had some fresh-caught striped bass, and made a beautiful plate that was not yet on the menu. 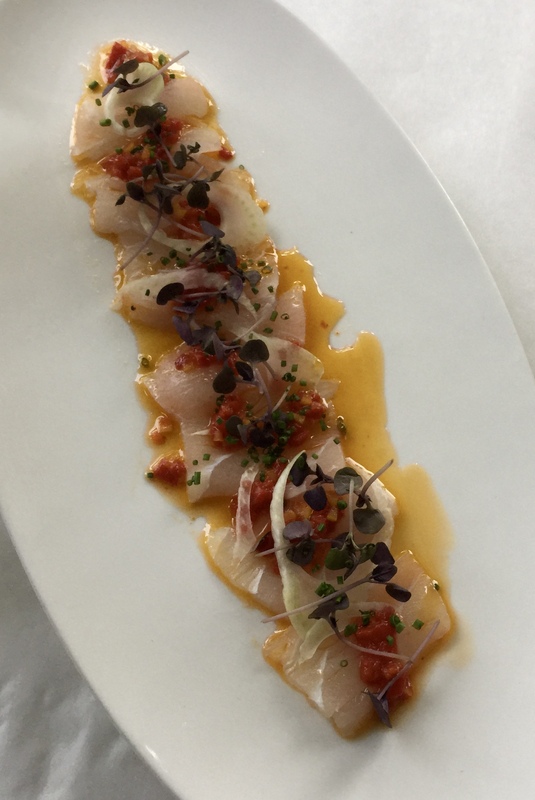 I’m not usually a fan of striped bass, but cutting it super-thin, and serving it crudo-style was brilliant. We told him he shouldn’t change a thing. Perhaps it’s on the menu by now. 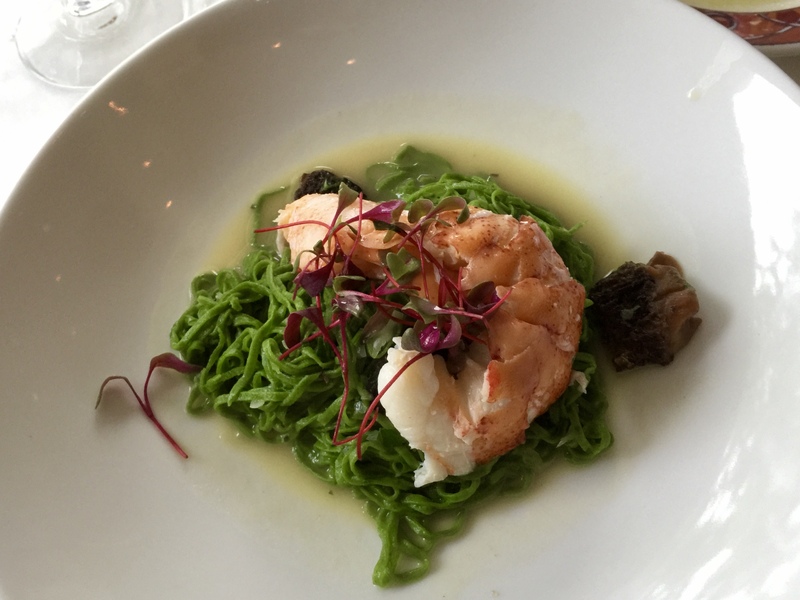 Lobster with spinach angel hair pasta. 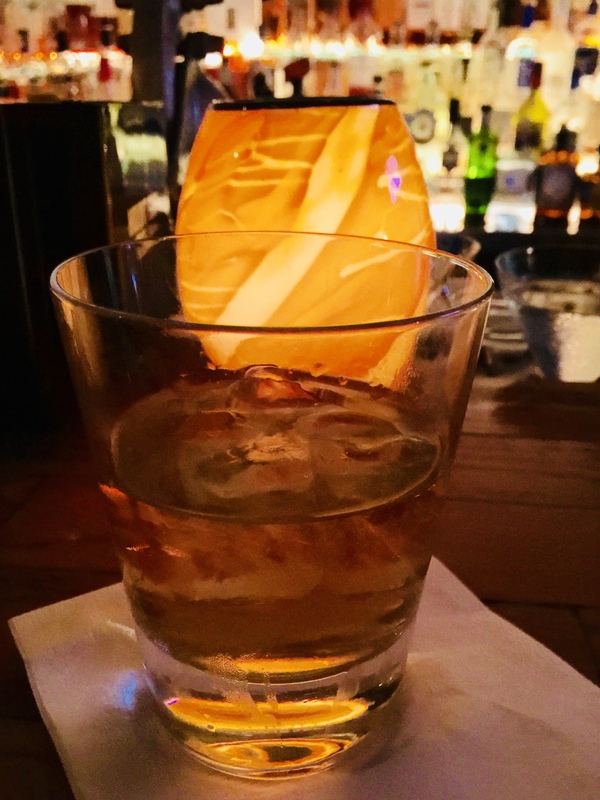 An after dinner sip of Blanton’s made the meal complete. Every bit of seafood at Fluke Newport is right off the boat. Produce and meats are from farms just up the road. And now, a chef that excels in putting them together for a fabulous meal.